We looked at the history and origins of the QWERTY-style computer keyboard in Tip 1009 — Looking at the Keyboard, Part 1. We saw that the QWERTY arrangement of keys evolved partly to slow down the typists and avoid jamming the levers on early mechanical typewriters. Today we will discuss how to best use the standard computer keyboard with CAD. If you do something only once in a while, it doesn’t matter that much in the big picture how long it takes. It’s what you do repeatedly, day in and day out, that counts. That’s why good form and good habits are so important. Set it up to be done automatically. Make it require little or no thought each time. Make a hotkey for it, well-placed on the keyboard (more on that later). Make a block or dynamic block (or family in Revit) that saves you time. Make a custom taskbar button or ribbon button for it. Make a template with all of the options logically laid out so that they are easy to grab quickly. Reduce the number of possible variations in the task to as few as possible. Find out exactly how many possible variations there are. “Chunk” them down into logical groups, if there are a large number. Many of these techniques are useful for Revit users as well. The hotkeys are different in Revit, but the strategy still applies. For example, let’s say you do a lot of CAD work involving chairs. Do you have a well-stocked and well-organized library of your favorite chair blocks? Do they have key data embedded in the block, such as manufacturer, cost, and dimensions? Do you have a handy record of which chairs were used in which projects, and the phone number of the sales rep? Let’s get back to the keyboard. Ideally the hotkeys you use most often will be placed in the left half of the keyboard. Why? So that your right hand can stay on your mouse and not be constantly jumping from the mouse to the keyboard and back. Each time you make such a jump with your right hand, you lose valuable time getting your hand in the optimal position on the mouse or keyboard. Similarly, you want your left hand to stay in one position for best typing speed. The keys in this “sweet spot” are Q,W,E,R,T,Y,A,S,D,F,G,H,Z,X,C,V,and B. Notice that the SPACEBAR key is in the sweet spot, whereas the ENTER key is not. Since the SPACEBAR often serves the same purpose as the ENTER key, it makes sense to use the SPACEBAR as a proxy-ENTER key whenever possible. Generally, this means any time you are not working in a text-editor box. MOVE is one of my most frequently used commands. With the above strategy in mind, I created a custom hotkey for MOVE which is V. The M key, which is the standard AutoCAD hotkey for MOVE, is outside of the sweet spot, so I find that V is easy for me to remember as an improved hotkey. COPY is another of my most frequently used commands. The standard AutoCAD hotkey C initiates the CIRCLE command, which I rarely use. Using the Command Alias Editor I changed C to be my COPY hotkey, and added CI as my custom CIRCLE hotkey. These changes to the hotkeys are easily made using the Command Alias Editor (go Express Tools tab > Tools panel > Command Aliases). Is this trivial? Taken individually, with just one strategy or command considered in isolation, it might seem to be. But when you consider how many times in your CAD career you will use common commands like MOVE or COPY, the seconds that you save really add up. These optimized hotkeys are even bigger time savers when compared to clicking on buttons in the Ribbon (or a taskbar) using the mouse. Each time you move the mouse’s pointer out of the work area, you lose precious seconds. First you have to find the correct button (the Ribbon made this harder, in my opinion), click on it, then get your pointer back to the “active zone” of the work area to select objects or place points. Ideally, the mouse pointer will remain in the “active zone” of the work area most of the time. The mouse pointer is the optimal tool for selecting objects and placing points. If you use the pointer both to initiate the desired command and select the objects, you’re only using part of your natural resources—one hand. As shown in the photo at the top of this article, the ideal AutoCAD user would be able to keep one hand on the mouse, one hand on the left half of the letter keys, one hand on the right half of the letter keys, and one hand on the numeric keypad to enter numbers and distances. Any genetic engineers out there? Most of us have only two hands if we’re lucky, so it’s worth learning and practicing the most efficient way to use them. Someday a better human-computer interface will come along, and we’ll forget all about the keyboard, just like we’ve mostly forgotten about the typewriter. Until then, the ideas above can give you a competitive edge. Knowledge is power. Good form + Lots of Practice = Mastery! Please leave a comment in the box below and let me know your thoughts and suggestions. Good article. 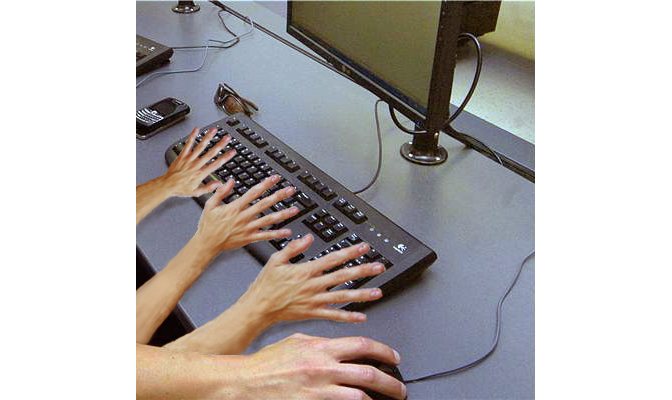 I am always trying to stress the time savings of eliminating keystrokes and how your left hand is master of the keyboard in CAD. Every time you remove your hand from the mouse you are losing time. Having been a more seasoned user (started on 12) I am heavy on keyboard input compared to menus and buttons. I also assign copy like you do, but make circle “cc” because it’s easier. That makes sense. Thanks for the tip! Mark, you have made a very big assumption, without stating it, about the so-called “sweet spot” on the keyboard. Your sweet spot keys are on the left side of the keyboard, whilst my sweet spots are on the RIGHT side of the keyboard. I use a left-hand mouse. You might point out to your readers that you actually wrote a right-handed article neglecting approx. 10% of users. The right side of the keyboard has a number of keys that are not commonly used in the Commands Alias, such as “K”, which I use for zoom. Y, H, L, and N are similarly available for right-handed keyboard shortcuts. It’s also helpful to note that a 5-button mouse is extremely helpful. I have “zoom-dynamic”, “cancel” (because it’s on the left side of the keyboard) and osnap settings mapped to additional buttons. You are absolutely right, and I apologize for leaving out discussion of left-handed techniques in my post. Unfortunately I have not yet had the opportunity to work with or learn from a left-hander regarding CAD methods. Thank you for your insights, and I hope you will share more of your experience along these lines. I will be happy to pass it along to my readers, many of whom could surely relate to the challenges and opportunities of being a left-hander in a right-handed mouse/keyboard environment! Most will agree. The number keys have always been on the wrong side of the keyboard (unless you’re a lefty with the mouse). Is there any one out there who mfrs one that could be separated to be placed left or right of the main board? You’d make a million! Also the number keys at the top of the board was thought up when keyboards were first made with a hammer and chisel! Everyone knows the number 1 and 0 are used most frequently. So why separate them on the keyboard by an entire continent? So much for progress in the CAD world! Evoluent makes a keyboard with the number keypad on the left. Of course, there are companies making separate number key pads that could be used too. Two of our Design Engineers use the separate key pad placed left of the keyboard. Yes! Finally someone writes about autocad zoom command.